The properties of E'GRID Biaxial Geogrids, made in Polypropylene (PP) with their square apertures, high tensile strength and optimised geometry of nodes and ribs make them equal to any other similar material. The reinforcing action of E'GRID Geogrids lies mainly in confining soil and increasing its shearing resistance by a process of interlocking between the square ribs and the soil. The load dispersal effect from the interlocking mechanism is highly effective and can reduce sub-base thickness and construction cost. 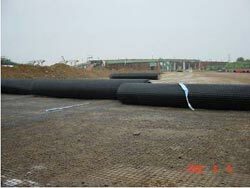 E’GRID Geogrids can be used with any kind of mechanical fill material. Two aperture size ranges are available for optimum matching with project fill. One layer or multi–layer E’GRID Geogrid construction distributes loading and disperses stress more effectively, leading to the reduction in differential settlement and improved foundation bearing capacity. 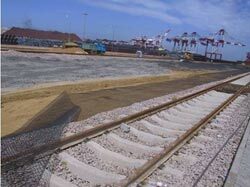 A tough platform can be established with E’GRID Geogrid reinforcement. Resistance to the impact of aircraft take off and landing is improved with more effective and immediate load dispersal. 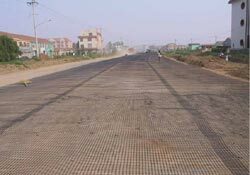 E’GRID Geogrid reinforcement gives ease of construction of temporary pavements with reduced construction time and cost.